The Newsletter this month is concerned with supporting each other, from helping with the many and various jobs around the Meeting on the one hand to safeguarding each other and ourselves on the other. In an interesting juxtaposition, John Lewis writes of Primo Levi’s book If this is a man in which he describes his transportation to Auschwitz and subsequent travels across Europe to get home in 1945, while Robert Parkes tells us of a recent conference at Woodbrooke on forced migration taking place now, 72 years later. “Colchester Meeting looks hard at itself!” In both words and pictures, this month’s edition describes the questionnaire and Threshing Day in which Colchester has been looking at how the Meeting might improve, both spiritually and physically. Looking at ways in which there might be an encouragement to participate at all levels by all ages, the Meeting discovered both those things that worked and those that didn’t as well as improvements which need to be made. There is also an article on the open area meeting of Elders and Overseers which considered membership, among other things. This month’s edition features a letter from the director of Mulanje Hospital, Malawi being supported by Colchester Meeting, and an article on a conference at Woodbrooke Quaker Study Centre, on forced migration. In this months edition, our Friend Joan Rew presents a very different take on the HS2 railway development. She argues strongly for the environmental loss there would be were the new railway line be built as planned. It is rare for there to be comment on ministry given in a Meeting for Worship, and so it is interesting that on page 7, the editor does just that. Such a comment adds to knowledge of how ministry is received in a Quaker Meeting. 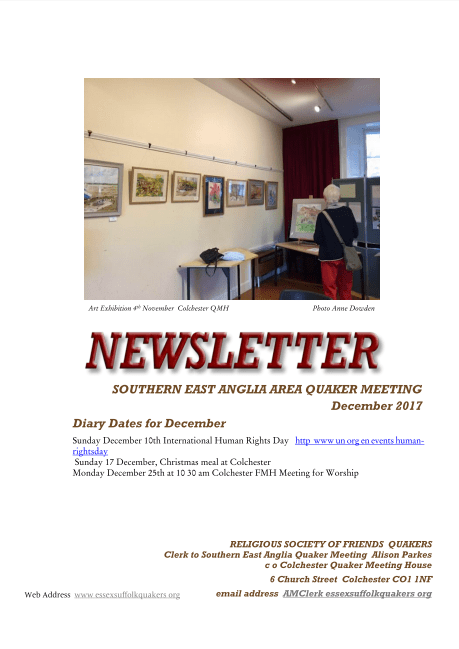 This month’s edition includes, among other pieces, a report and photographs of the Area Meeting’s weekend at High Leigh; the second instalment of a Friend’s discovery of Quakerism and the building of Clacton’s meeting room; and two Young Friends’ writings on Remembrance Day. This month’s edition includes, among shorter items, an optimistic look at the future of Quakerism by Ben Pink Dandelion; the first part of an autobiography of a mature Friend; and a challenge to change the current committee structure of local Meetings. 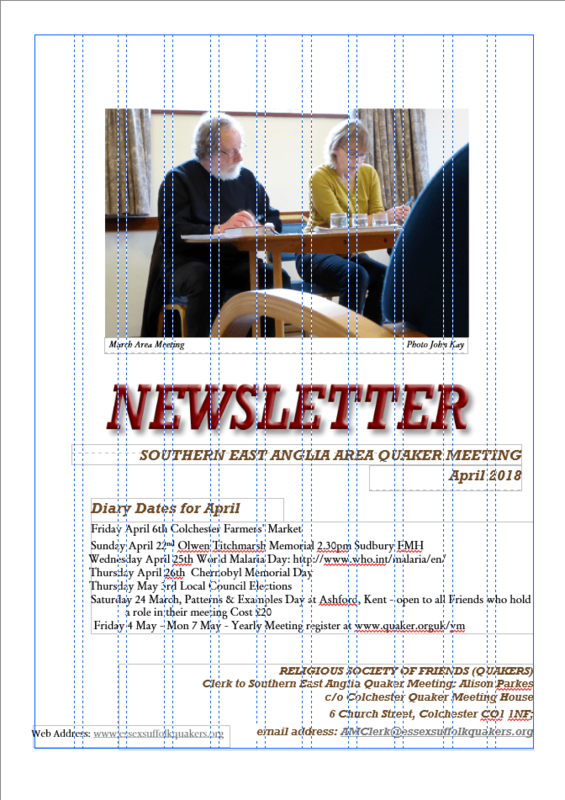 This month’s Newsletter is somewhat shorter than usual, but it does contain a very helpful article by the Area Meeting Clerk on the peculiar Quaker practice of Nominations. This month’s edition has reports on Glebe House, Quaker Life Representative Council conference on death and dying, Trustees and financial matters, and Area Meeting at Earls Colne. Featured are on two Area-Meeting Friends: one as a prisoner of war and the other a luthier who has been making viols for over forty years. spiteful, culminating in the tragic murder of a much-loved young MP. Let us hope that things may have shocked some people into slightly kinder behaviour, but I don’t depend on it…..
when we clasp warm hands. Sixteen elders and overseers from including five from Mid Essex took part in a full day session led by Barbara Windle, of Friargate meeting, York, and Mary Jo Clegg, of North West London AM. It was a varied programme beginning and ending with silent worship…. We are well into the new year now and a very muddling time it is! One minute much too hot, and the next minute freezing cold. But f we can just hold our breath for a bit, we may slide safely into spring. (At my age I can remember many winters when it only started to be cold well into February and then the snow really started)…. Meeting at a time when the nations of Europe are engaged in a war of unparalleled magnitude, we have been led to recall the basis of the peace testimony of our religious Society…. Our Meeting is full of activities: last week we had the local Heritage Week and we are always gratified by the large number of visitors who drop in and want to know all about us and what we do. We usually have some kind of exhibition and perhaps a short film, and of course cakes and coffee. It is fun but remarkably tiring…. MfS has a visionary and prophetic role for the whole Society in Britain. It’s been described as the beating heart of the Society. It decides the priorities and sets the direction of BYM in the Long Term Framework. It plays a vital role in fostering communication throughout the Yearly Meeting and in reviewing and testing concerns referred to it by AMs. Life is disappointing and frightening at the moment, and our government is plodding on with its plans regardless of increased need for food banks, hospitals desperate for cash, and all the rest of it. As I have often said, all we can do is make sure that nobody in our neighbourhood is in difficulties if we can help it…. Yes, it is Spring again, and as so often we are horrified to read of thousands of refugees trying to cross the Mediterranean to reach what they suppose is safety and a new life, but though it makes a fortune for the traffickers, it usually ends in death for refugees, or at the very best, for life in some sort of camp…. We have been through a bad time financially and now our leaders are making much of the small shoots of growth that they see is arriving, but I don’t believe in it, far too many people are not really on proper wages (as can be seen by the fourfold or more use of our food bank) while those who are really indecently rich are evading tax. Benefits are quietly cut in all directions, and far too many people are not doing satisfying work. Christmas is over, such an exhausting time but I do enjoy seeing all my family. Now is a time to do all the useful things, mend socks, write to people you forgot to send cards to, try to get the garden in some sort of order, and hope that it is not going to be quite so cold as it seems likely to do. I have to admit that I did not enjoy the winter before last. I have only just realised that Christmas is dashing towards us like an express train! (if such things still exist). This newsletter will be out by the beginning of December, but there will not be one in January. (There never is, as we should have to be struggling with it over Christmas) Not very Christmassy weather right now, but I am thankful, and hope it lasts. We have an active Meeting with all sorts of happenings which you can read about elsewhere, as (being aged) I don’t get to as many as I would like. Paul Parker, always an inspiring speaker, spoke recently at Sudbury, and we had an open house during Colchester Heritage Week, when we always get a lot of visitors. Now it is autumn, (October has always been a favourite month) a time for new beginnings, a new year at school, a much better time than spring for a good clean out and getting rid of things, with the exciting feeling of Christmas round the corner, but not so near that you have to get into a panic about it. I am not going to wail about the awfulness of life, but one does walk on tiptoe, wondering what next! I have a good pension and a wonderful family and nothing particular going wrong, but far too many people are finding their income shrinking and their expenses growing, while everyone says we are doing wonderfully. Did you know that in this country the people who are the richest earn 143 times more than the hardest-up? I don‘t know how other countries fare, but I believe we are the worst. You will be comforted to know that Friends House staff have a ratio of just four to one. Last year it was never warm enough to wear summer clothes so I am wallowing in the nice feel of cotton next my skin. Not to mention the nice feeling of lower fuel bills.